Lennox-Gastaut syndrome (LGS) is an epilepsy syndrome that begins during childhood and is characterized by frequent—often daily—seizures that are difficult to control with medication. While you can live well into adulthood and older age with LGS, there is a moderately higher risk of dying due to issues such as injury, seizures, medication side effects, or health problems such as infections. The symptoms of LGS begin in early childhood, typically before the age of four. Seizures are the most prominent symptom, and most children who have LGS also have a delay in developmental milestones. LGS continues into adulthood, but symptoms generally change as you get older. Children with LGS often have many different types of seizures, while adults tend to have fewer types and less frequent seizures. Often, people with LGS have cognitive impairment. Physical abilities may be compromised as well, which can interfere with independence. One of the hallmarks of LGS is that children have several types of seizures. They occur frequently, even several times a day, which is much more frequent than with most other types of epilepsy. Seizures may be preceded by an aura, which is a sensory change or a feeling that a seizure may happen. It can be difficult for someone who has cognitive impairment to notice an aura. However, parents and siblings might learn to recognize signs that a seizure may be coming on. Often, a person who has had a seizure may feel groggy afterward and may even be unaware that a seizure occurred. Tonic Sudden muscle rigidity, possible recurring relaxation and stiffening Possible <20 sec. Atonic Loss of muscle tone, possible falling Yes <15 sec. Myoclonic Brief spasms of arms and/or legs Rarely 1-2 sec. Absence Appearance of "spacing out," staring into space, lack of awareness No <15 sec. Tonic-clonic (less common) Involuntary jerking and stiffness, impaired recollection of event Frequent 1-2 min. Status epilepticus Seizure doesn't stop on its own, requires emergency injection of medication; in LGS involving absense, tonic, or tonic-clonic seizures; can cause brain damage, death Possible, depending on type >5 min. Children who have LGS also experience developmental delays. Cognitive and physical delays are both possible. The severity of this symptom varies greatly from person to person. However, sometimes no cause can be identified. West syndrome has many causes, and children who have both LGS and West syndrome may need treatment for both conditions. West syndrome is often treated with adrenocorticotrophic hormone (ACTH) or steroids. A disorder in which tumors grow in multiple areas of the body, tuberous sclerosis can cause LGS and physical and/or cognitive deficits. Hypoxia is oxygen deprivation. Children who hypoxia before or shortly after birth often experience consequences that affect brain development and function. This can manifest with a variety of problems, including LGS with or without West syndrome and cerebral palsy. Encephalitis is an infection or inflammatory disease of the brain. It's likely to cause persistent problems, and LGS can be one of them. A type of abnormal brain development that occurs before birth, cortical dysplasia is characterized by brain malformations and can cause LGS. Cortical dysplasia can be caused by genetic or hereditary problems, or by lack of oxygen or blood flow to the baby. In some cases, no reason is identified. It is emotionally difficult to find out that your child has LGS. Most parents already have an idea that something serious is going on because of the repeated seizures and developmental problems. However, most parents also wish to hear that there is a minor cause behind the symptoms, and especially one that can be easily cured with medication or surgery. If your child has symptoms of LGS, rest assured that your child’s doctors will test for all possibilities, including serious and minor diseases, and will not overlook important diagnostic tests or simple treatments for your child’s condition. The most consistent features of LGS are the clinical features and the pattern seen on an EEG. Diagnosis may take weeks or months. Sometimes, LGS is a diagnosis of exclusion, which means that other diseases have to be ruled out before a child is diagnosed with it. If your child has several types of seizures and they're frequent, especially if there is a cognitive or physical delay, your doctor will consider a diagnostic workup for a syndrome such as LGS or West syndrome. Most children who have seizures will have brain imaging, which can include a CT scan, MRI, or ultrasound. MRI is considered the most detailed of these tests, but it requires a child to lie still in the machine for about half an hour. That's just not possible for many young children or babies. For young kids, doctors may order a CT scan instead. For babies, an ultrasound may be a better option. It's faster and can identify early problems with brain development. 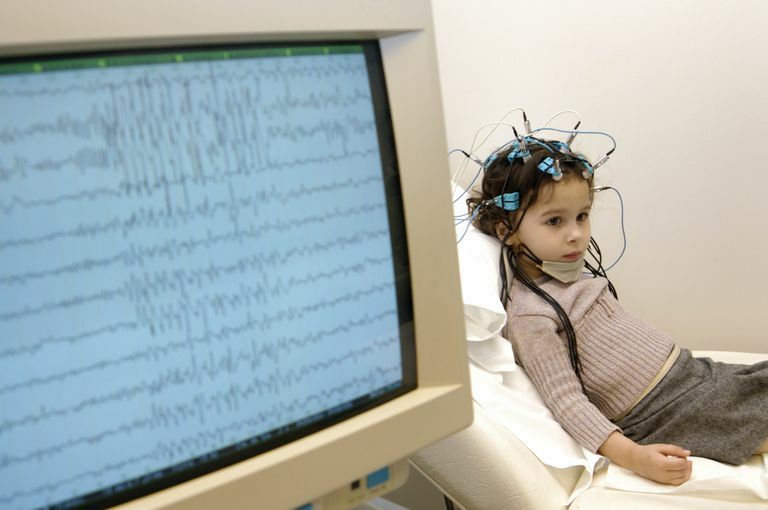 In many cases of LGS, an EEG will show a distinctive slow spike wave and pattern when a seizure is not happening. Not everyone with the condition has this pattern, though. When someone with LGS is actively having a seizure, the EEG pattern is generally consistent with the seizure type. Often, blood tests to evaluate for an infection or a metabolic disorder are part of the initial evaluation of seizures. If your child with LGS has a sudden worsening of seizures, his or her doctor will check to see if there is an infection, which can produce more seizures in people with epilepsy. As part of the initial evaluation, your child may have a lumbar puncture, which is a test that examines the cerebrospinal fluid, which surrounds the brain and spinal cord. The fluid is collected with a needle inserted into the lower back. The procedure is uncomfortable and can be stressful or scary for children, particularly if they're cognitively delayed or cannot understand the diagnostic process. If your child’s doctor strongly suspects a brain infection or inflammatory disease, they may want to perform this test while your child is under anesthesia. The seizures of LGS are difficult to control. Even with medication, most people with the condition continue to have some seizures. However, treatment is necessary, as it can reduce seizure frequency and severity. Additional treatments include the ketogenic diet and epilepsy surgery. Specific medications are used to control the seizures of LGS, as many of the usual anti-seizure drugs are not effective. Despite these anticonvulsant options, people with LGS often continue to suffer from persistent seizures. Some of the medications used for LGS seizure control can have serious side effects, and they are reserved for especially difficult-to-control cases. Cannabis has gained a great deal of attention as a treatment for childhood epilepsy, and in 2018 the U.S. Food and Drug Administration approved Epidiolex (cannabidiol or CBD) for treatment of seizures in patients with LGS. The ketogenic diet is a high fat, no carbohydrate diet that can help control seizures in people who have hard-to-manage epilepsy. It can reduce seizure frequency and severity in LGS, and it can make it possible to reduce the dose of anti-seizure medication. The diet itself is not easy to follow because of the carbohydrate restriction, and it may be more practical for those who are dependent on others for providing food. Refractory epilepsy is epilepsy that does not improve with medication. Epilepsy surgery is an option for some people with refractory epilepsy caused by LGS. Procedures include surgeries in which the seizure-promoting region of the brain is removed to stop seizures. Another procedure, a corpus callosotomy, involves an incision in the corpus callosum (the area that connects the right and left sides of the brain) to prevent the spread of seizures. Placement of devices such as a vagal nerve electrical stimulator (VNS) may also be considered to prevent seizures. Your child may benefit from one of these types of brain surgery, and pre-surgical testing is needed to determine whether there is a chance of improvement. If your child has LGS, you'll likely have to deal with many medical, social, and behavioral issues as your child gets older. This is not an easy situation for anyone. You may need help from siblings or other relatives to care for a person who has LGS. As you embark on this challenge, there are several strategies you can use to optimize your child’s medical condition and quality of life, and to ease the burden on you. LGS is a complex, lifelong condition that is not curable. While not everyone has the exact same outcome and prognosis, there are certain things you can expect. It helps to familiarize yourself with the disease and its probable course so you can anticipate medical, behavioral, and emotional challenges as your child gets older. Some children with LGS continue to see their pediatric neurologists as they enter adulthood, and some move to the care of an adult neurologist. This depends on the availability of neurologists in your area and their specialization with epilepsy, as well as your preference. Your child’s education and social adjustment may be a challenge. If possible, look for a school that has resources geared toward epilepsy as well as learning and behavioral disabilities. Maintain close communication with the staff members who oversee the services that your child needs, and stay in contact with teachers and your child’s aids. Listen to feedback and understand that your child may need to change schools. Taking care of someone with a disability is exhausting. If you can get help from family members, friends, volunteers, or a professional caregiver, this can provide you with relief and give your child or adult with LGS some variety and a fresh perspective. You might consider looking for a day camp or daycare where your child can interact with other kids and receive proper care while you work or take care of other responsibilities. If physically caring for your child with LGS is becoming impossible, you may need to seek alternative living arrangements. Many parents opt for this due to their own health issues, to devote more time to other children, the need to work, or an inability to deal with behavioral problems. You can search for and research assisted living centers by talking to your healthcare providers, speaking with current or former patients, and interviewing staff and leadership. Once your child moves to a living facility, you can visit and maintain a close relationship. LGS is a rare disease, and meeting others who are dealing with it can give you and your child resources and support as you navigate the illness throughout the upcoming years. Support groups are a great place to find this. If you don't have any support groups near where you live, you may be able to find one you like online. LGS is a rare neurological disorder that has a major impact on a person’s life and the life of their whole family. Resources are available to help you get the best care possible. As a caretaker, it's important for you to have time off. Be sure to reach out for the help you need and practice self-care. Asadi-Pooya AA. Lennox-Gastaut syndrome: a comprehensive review. Neurol Sci. 2018 Mar;39(3):403-414. doi: 10.1007/s10072-017-3188-y. Ostrovsky DA, Ehrlich A. Addition of Cannabidiol to Current Antiepileptic Therapy Reduces Drop Seizures in Children and Adults With Treatment-Resistant Lennox-Gastaut Syndrome. Explore (NY). 2018 May 1. ppi: S1550-8307(18)30177-0. doi: 10.1016/j.explore.2018.04.005. Vignoli A, Oggioni G, De Maria G, et al. Lennox-Gastaut syndrome in adulthood: Long-term clinical follow-up of 38 patients and analysis of their recorded seizures. Epilepsy Behav. 2017 Dec;77:73-78. doi: 10.1016/j.yebeh.2017.09.006.